This book chronicles the discovery and analysis of animal fossils found in one of the most important paleontological sites in the world—Porcupine Cave, located at an elevation of 9,500 feet in the Colorado Rocky Mountains. With tens of thousands of identified specimens, this site has become the key source of information on the fauna of North America's higher elevations between approximately 1 million and 600,000 years ago, a period that saw the advance and retreat of glaciers numerous times. Until now, little has been understood about how this dramatic climate change affected life during the middle Pleistocene. 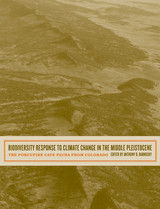 In addition to presenting state-of-the-art data from Porcupine Cave, this study also presents groundbreaking analysis on what the data from the site show about the evolutionary and ecological adjustments that occurred in this period, shedding light on how one of the world's most pressing environmental concerns—global climate change—can influence life on earth. Anthony D. Barnosky is Associate Professor in the Department of Integrative Biology at the University of California, Berkeley, and coeditor, with R. A. Martin, of Morphological Change in Quaternary Mammals of North America (1993).